Self-driving engineering is a skill with applications beyond just cars Tech companies like Google, Nvidia, Apple, Uber, and Huawei along with car companies like Audi, General Motors, Nissan, Toyota, and Tesla are currently investing substantial resources in developing autonomous technologies. We can, therefore, expect several automated hardware and software offerings to emerge for both industrial as well as consumer applications soon. 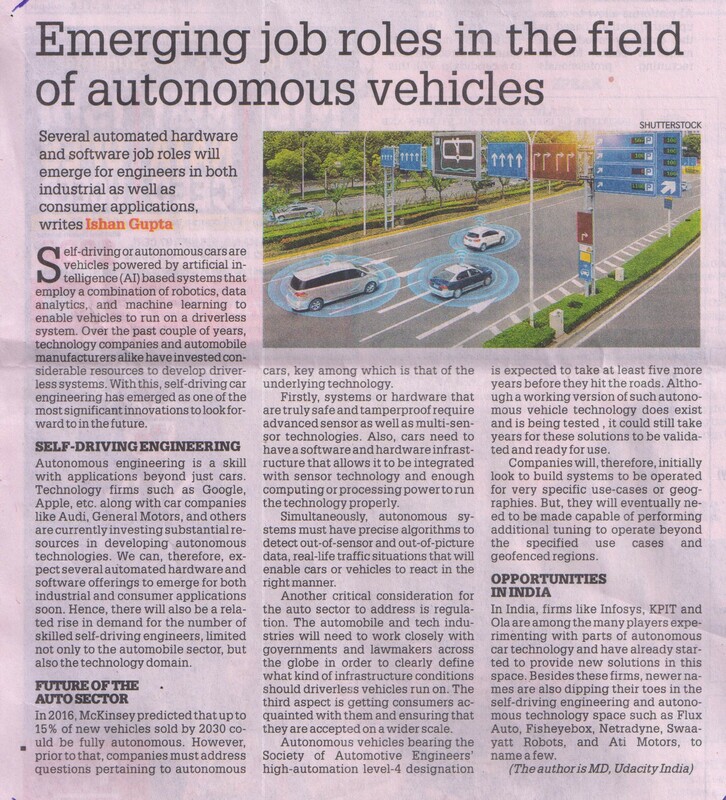 Hence, there will also be a rise in the demand for the number of skilled self-driving engineers, limited not only to the automobile sector, but the technology domain. Future of the auto sector In 2016, McKinsey predicted that up to 15 percent of new vehicles sold by 2030 could be fully autonomous. However, before that happens, companies need to address and resolve some of the pressing questions pertaining to autonomous cars, key among which is that of the underlying technology. Firstly, systems or hardware that are truly safe and tamperproof require advanced sensor technologies as well as multi-sensor technologies. Also, cars need to have a software and hardware infrastructure that allows it to be integrated with sensor technology, as well as enough computing or processing power to run the technology on. Simultaneously, there is a need for autonomous systems need to have precise algorithms to detect out-of-sensor and out-of-picture data, real-life traffic situations that will enable cars or vehicles to react in the right manner. Another critical consideration for the auto sector to address is regulation. The automobile and tech industries will need to work closely with governments and lawmakers across the globe in order to clearly define what kind of infrastructure conditions should autonomous or driverless vehicles run on. The third, and often overlooked aspect of autonomous technologies is getting consumers acquainted with them and ensuring they are accepted on a wider scale. Autonomous vehicles bearing the Society of Automotive Engineers’ high-automation level-4 designation is expected to take at least five more years before they hit the roads. Although a working version of such autonomous vehicle technology does exist and is being tested, it could still take years for these solutions to be validated and ready for use. Companies will, therefore, initially look to build systems to be operated for very specific use-cases or geographies but will eventually need to be made capable of performing additional tuning to operate beyond the specified use cases and geofenced regions. Scope of autonomous or self-driven vehicles in the Indian market In India, companies like Infosys, KPIT and Ola are among the many players experimenting with parts of autonomous car technology and have already started to break ground on new solutions in this space. Besides these companies, newer ventures are also dipping their toes in the self-driving engineering and autonomous technology space such as, Flux Auto, Fisheyebox, Netradyne, Swaayatt Robots, and Ati Motors, to name a few. Learn how Udacity can help build capabilities on emerging technologies for your workforce.